The Martin T65 represents a point of entry to semi-automated machines designed for professional users with a high output. Accuracy throughout the life of the machine is something Martin works hard to achieve and their commitment to achieving this is exemplary, if not legendary. 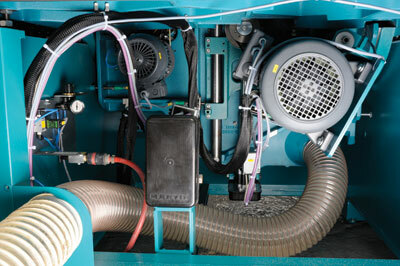 A steel and concrete composite is the foundation on which their machines are built. The patented design was introduced as long ago as 1920 by the company's founder Otto Martin. It boasts six times the vibration and dampening properties than that of a traditional cast-iron or welded frame. The benefits are perhaps more noticeable on a smaller machine, but weighing in at 1,600kg for the basic model, I doubt whether this could be included in that category. At this level it's nigh on impossible to find fault with any manufacturing or issues with finish. Martin machines are superbly built but more importantly expandable as the years roll by; something that should be taken into account when considering a purchase of this kind. The T65 has a similar digital interface to the T75 that we looked at in F&C185 although it's mounted on a control panel alongside the on/off switches and not on an elevated screen. As an entry level machine the T65 is understandably short of some of the main features. Having said that, there are still options within the software that are unnecessary for what is still predominately a manually operated machine. 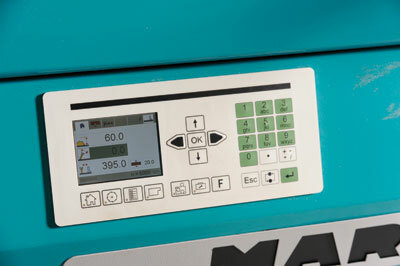 The dialogue between machine and operator is none-the-less intuitive and largely there to maintain the level of accuracy upon which Martin has built its reputation. 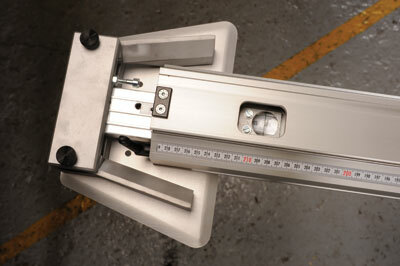 Important data such as fence position, blade height and angle are on constant display. The process is centred around a main menu with commands input from a numeric keyboard and smart key. While blade adjustments are fully automated, fence location is a manual affair with the benefit of digital readout. The T6589 accessory is a wheel and locking lever located on the operator's side of the sliding carriage negating the need to be constantly walking around the machine. 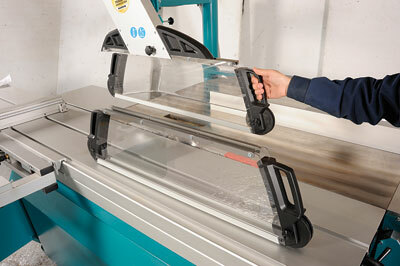 If your cutting lists generally run to more than a few lines you'll be glad of this upgrade. 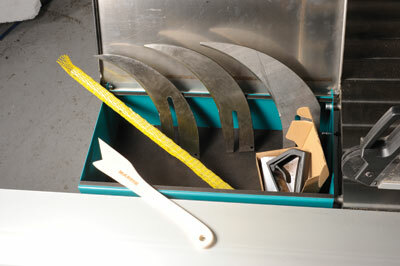 A large blade guard could be considered a cumbersome device likely to obscure the operator's view of the working area. 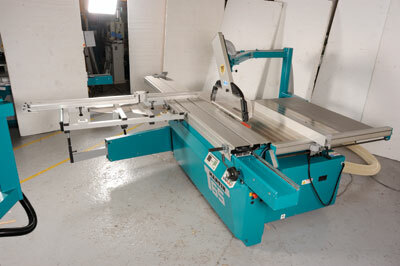 The T65 has a cutting height capacity of 204mm so there's little option for anything other than a large canopy. Interestingly it doesn't hamper working and there is a choice of two: one for upright cuts and a second for bevelled work that accommodates a 550mm dia. blade. Both slide out from the main arm, which in turn swings away from the working area to give more room for blade changes. 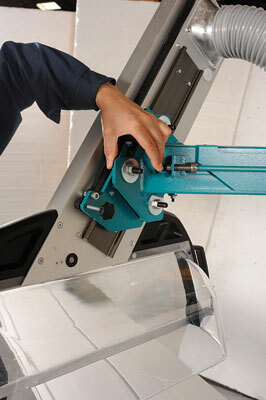 For Martin machines, long gone are the days of wrench and spindle locks. Instead they have a single Allen key device - ProLock - that spreads a split pin to lock the blade in place with no more effort required than a gentle push. The software package will store up to 50 different settings for individual blades and adjust the scoring blade to suit; so no need for test cuts and fiddling around trying to align the two kerfs. To alter the rotation speed of the blade you need to access the main drive belt through an opening in the cast iron trunnion behind the main blade. 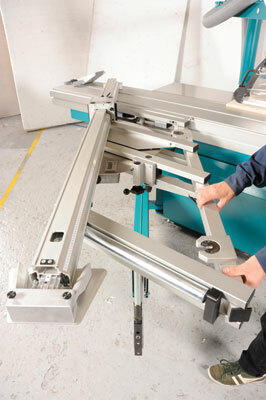 If you intend to be working the full range of blade sizes regularly you may wish to look at the variable speed control system that allows adjustments to be made without stopping the machine. Our T65 came with the T6535 mitre crosscut table that encompasses a parallelogram design to give support to the workpiece at every angle. A digital display records adjustments within a range of +/- 46.5°. The whole unit moves freely and can be positioned along the sliding carriage as well as being entirely removed. The fence rail can be positioned in front of or behind the table. The length stops offer good support and once again, digital feedback combined with a magnifying lens over the scale make adjustments quick to set. There are machines out there of similar capacity. Some may even have identical features but you will have to search long and hard for one with both. My concern is that serious players will not be satisfied with just an entry level machine when, to benefit from all the Martin features, a few upgrades are necessary. However, once installed there is nothing stopping you from upgrading at your leisure.